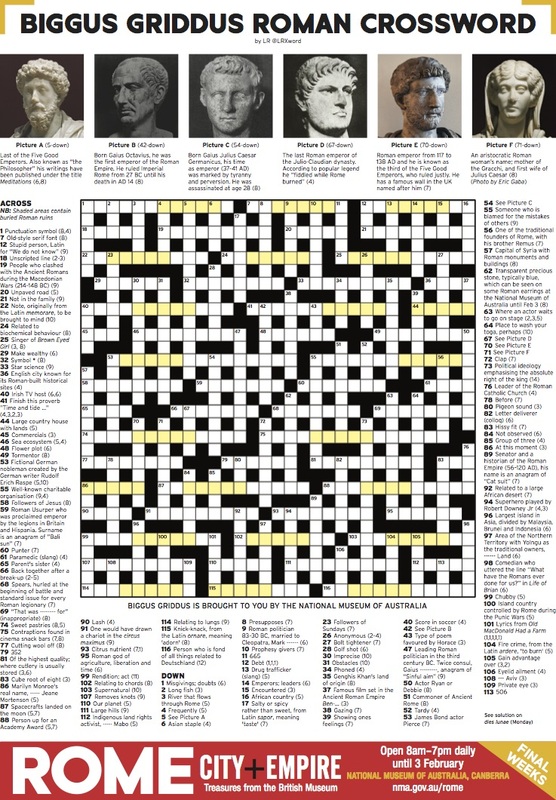 Recently I was approached by the National Museum of Australia to supply a giant crossword to promote their AMAZING-looking exhibition in Canberra. It’s all about Ancient Rome and I have learned so much about the empire through the process. They took out a full page in the Canberra Times and I am really happy with the result. As you will see they have used a pretty standard newspaper template and put some subtle branding on it. Please feel free to download a copy here and share it with anyone who loves this sort of thing - especially those in the Canberra area. Hopefully the crossword will be a successful campaign for the Museum, and other forward-thinking businesses might follow their lead - meaning more crosswords for everyone. I’ve been saying for YEARS that I think more companies should sponsor the puzzles pages in the newspaper. Think of all the eyeball-minutes of people whose daily ritual is to fill out the crosswords from A to Z and the sudoku from 1-9. A crossword is the type of marketing content that can keep people glued to a page for hours. Think of the prestige of being associated with the smartest part of the paper. As long as the ads aren’t tacky what is there to lose? It generally seems that the puzzles page is treated as sacrosanct, and there are rarely ads on the page. Maybe it’s because there are already too many puzzles squeezed in leaving no space for any ads? SOLUTION here if you need it!